The innovative ConceptDraw Arrows10 Technology of flowchart making included in ConceptDraw DIAGRAM is a powerful drawing flowcharting software that changes the way diagrams are produced. While making the drawing process easier and faster. ConceptDraw DIAGRAM is a powerful tool that helps you create professional looking cross-functional flowcharts with the well-designed objects. ConceptDraw DIAGRAM allows you to focus on work, not the drawing process. ConceptDraw Arrows10 Technology allows to draw connectors with smart behavior that gives flexibility to you during work process and flowchart making. The Cross-Functional Flowcharts solution helps you to visualize and communicate the operations of a business process flow step-by-step, with responsible people or departments for each operation. The RapidDraw functionality inherent in ConceptDraw DIAGRAM makes the task even easier — flowchart steps can be created with a single click, automatically triggering the next step in a process, using a logical algorithm to align themselves on the page in the most effective manner. For an extra resource. Example 1. 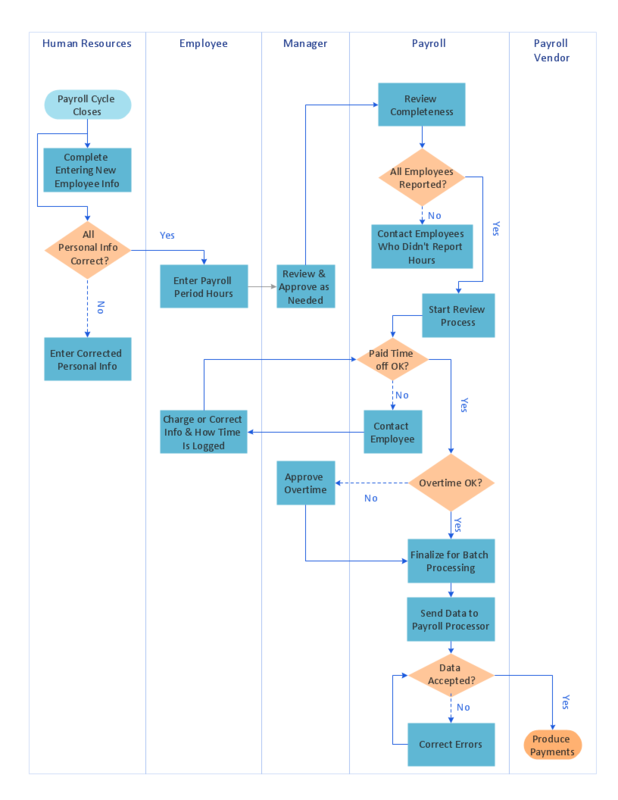 Swimlane process map diagram - Payroll process. ConceptDraw DIAGRAM diagramming software provides vector symbols and connector tools for quick and easy drawing diagrams for business, technology, science and education. It is best flowchart maker. ConceptDraw DIAGRAM v12 can help you make professional diagrams quickly. ConceptDraw is a best data visualization tool that will allow everyone to create rich infographics and visualizations quickly and easily. Business Process Modeling Notation -BPMN- is a set of standard symbols that allow you to create a graphical view of a business process. The symbols were developed to help users develop standard, unified structure of processes, and any messages shared between these processes. This is business process improvement tools. ConceptDraw DIAGRAM v12 is the best program to make workflow diagrams. With the new Arrows10 technology it brings features allow you make workflow diagrams faster then ever before. These features allow you to focus on thinking, not drawing, that makes ConceptDraw DIAGRAM v12 the best program to make workflow diagrams.